Blog Are Ultracapacitors Ready for Prime Time? A January 3 article in Automotive Engineering International Online highlights the potential for ultracapacitors to take some of the battery market for vehicle power. 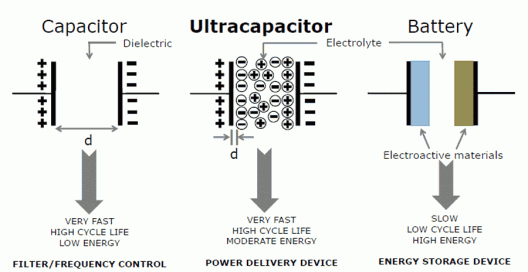 The positive side of ultracapacitors would seem to demand their use over that of batteries. They can produce up to 10 times the power of batteries – important in acceleration. They handle temperatures down to -40°C (-40° F), something which drops battery power outputs to near uselessness in many cases. They last forever compared to batteries, can be charged in minutes as opposed to hours, and can even be recycled more fully than batteries – some of whose chemistries are toxic. Prices are dropping quickly. A 3,000-Farad ultracapacitor sold for $5,000 10 years ago. Today, it sells for $50. Battery prices have come down only 30 to 40 percent in the same time. Such a device can store 3,000 Amp-seconds of energy, meaning it could discharge 3,000 Amps at one Volt for one second. More logically, it might discharge 100 Amps at one Volt for 30 seconds. Change that to 30 Volts to turn a motor quickly, and the limits of even an ultracapacitor become apparent. Although ultracapacitors have enormous power densities compared to batteries, batteries (so far) have absolutely superior energy densities. A large ultracapacitor might kick an electric dragster off in record fashion, but it might not even come close to finishing the quarter mile – an example of short-lived power. A large battery pack would not necessarily provide the initial acceleration, but its energy would last for many miles at a reasonable speed. There is not the power for acceleration because the battery cannot charge and discharge its stored energy as quickly as an ultracapacitor, but within its performance range, can dispense its energy over a longer time. Michael Leiber of Ioxus, a producer of ultracapacitors, wrote the Society of Automotive Engineers article, and explains the automobile industry’s growing embrace of the devices. “In hybrid buses, for example, ultracapacitors are used to improve fuel economy and reduce emissions. Some hybrid architectures are also especially attractive for large vehicles, such as urban transit buses and delivery trucks, in stop-and-go driving. Conventional buses and trucks of this type use huge amounts of fuel and produce high levels of toxic emissions because they have large, typically diesel engines that are constantly ramping up and down, which is the least efficient way to operate a power source. As Leiber notes, various combinations of ultracapacitors with other devices might produce enhanced performance in a variety of applications. His firm is working with a battery-capacitor combination for power tools, for instance, that would enable one-minute recharging, a boon to productivity. Inhabit.com explains the process, including the downside. “With Ioxus’ new hybrid energy-storage device, which connects a lithium-ion battery to an ultracapacitor, everyday power tools could be fully recharged in less than a minute. Not just that, but the tools will be capable of receiving up to 20,000 charges. This means that the construction industry will no longer have to wait hours for electric drills or lathes to charge; they could be done in less time than it takes to make a cup of coffee. The ability to combine electrical components and energy storage devices may lead to a series of breakthroughs applicable in electric aircraft. This is the first of several articles which will explore approaches now being pursued. One logical use for ultracapacitors for PAV’s is in powering electric wheels at takeoff. A takeoff roll will typically be 5 to 10 seconds. If that can be reduced to 3 seconds with the combined effort of the prop and a powered undercarriage then the take of distance is considerably reduced (landing is another matter obviously). This is less attractive for long haul flights, but where vehicles are used for flights of an hour or less the benefits of powered wheels become more interesting. This also fits in with the pocket intersuburban airstrip concept and with electric aircraft where the wheels can be used for ground movements.